Moscow in December is cold, yes, but it's also one of the most magical times of the year to take in the city's sheer beauty. 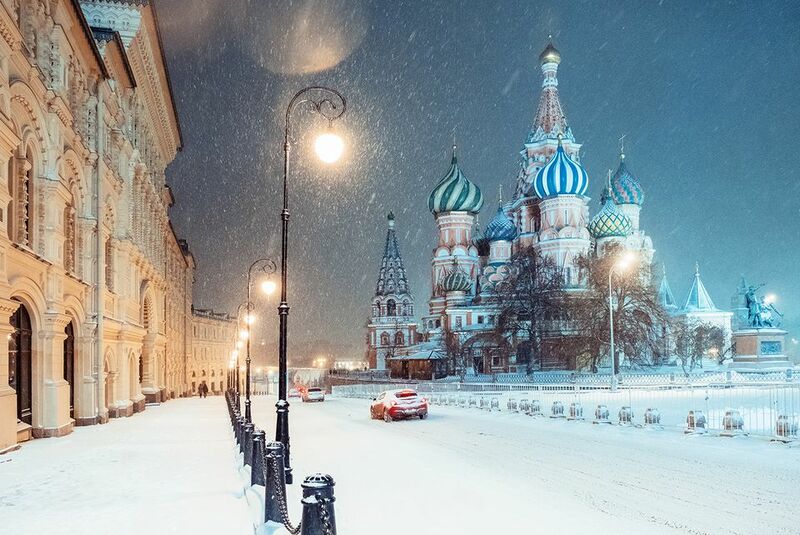 Whether you're interested in watching the famous ballet perform or admiring the incredible architecture of Saint Basil's Cathedral or other landmarks, Moscow has something to offer everyone as long as you bundle up. The city's winter begins in November and lasts through February. In December, the weather is unusually cold and wet with snow—potentially lots of it. This isn't the type of snow that clears up after a day or so, either. With temperatures remaining below freezing, the snow typically sticks around until the spring thaw, so it's best to come prepared with lots of sturdy clothing appropriate for the freezing temperatures. As you would expect, Moscow's weather in December is frigid. The city's overall average temperature is well below freezing at 23 degrees Fahrenheit (-5 degrees Celsius). Moscow experiences a mix of snow and rain throughout December, with around three inches of rain that's spread across 12 days in the month. Snow accumulations are much less, clocking in at just under an inch. Wind chill is a major factor to consider in Moscow and can make the city seem much colder than the actual temperature. Winds in December typically average 12 miles per hour. The city is quite dark in December, averaging just seven hours of sunlight throughout the month. Pack for freezing conditions for December travel to Moscow. Make sure that your winter-weather clothing is of high quality and is guaranteed to provide plenty of insulation. Don't forget to bring a heavy-weight winter coat, boots with tall, warm socks, a hat, gloves, and scarf. Ideally, your jacket should fall to beneath the hip for maximum protection from the cold temperatures. Adding extra layers is crucial, especially if you’re coming from a warmer climate. Think insulated leggings and base layers on top. Keeping your head covered to trap in heat is essential, as is waterproof footwear. Even though Moscow doesn't celebrate Christmas until January, the city is still extremely festive, with plenty of winter performances and celebrations to ring in the season. The annual Russian Winter Festival kicks off in the middle of December. Ice skating, winter markets, and amusement park rides are all part of the festivities, which are held from December 25 to January 5. The Christmas classic "The Nutcracker" is typically performed each yeat at the Royal Moscow Ballet throughout the season. The cast of the famed Tchaikovsky work includes 32 dancers, 80 sumptuous costumes, and a visually stunning set. On December 31, Russia's New Year's Eve celebrations take over Red Square. Consider watching the fireworks display from another vantage point if you can't handle standing for hours in the cold! Christmas in Russia takes place on January 7, but the time between Christmas and New Year's is usually a time of rest and vacation for Russian families, many of which jet off to warmer locales. Head to Red Square to see the New Year's Tree and look for decorations at GUM, Arbat Street, and other well-known locations. Moscow's outdoor ice skating rinks provide the opportunity to enjoy one of Moscow's most popular cold-weather activities. A Moscow museum visit is the perfect way to escape the cold outside. You can easily spend hours in museums such as the Tretyakov Gallery, the State Armory Museum, or the Pushkin Museum of Fine Arts. Some businesses such as restaurants and family-owned stores may close or have reduced hours during the holiday period between Christmas and New Year's, so some of these closures may spill into December dates. While you might be tempted to imbibe the copious amounts of Russian vodka available, consume in moderation: Drunkenness causes heat loss.